added on the 2010-10-19 17:41:10 by JAC! Two 32 bytes intros for the Atari 800 XL (PAL). This one shows a twirl of colored particles which expands with every iteration. In the end it will become a chaotic star field. At certain times during the expansion, there balance between dark matter and normal matter is broken. This is indicated by a changing background color. If the background changes back to black again, it is save to turn off the demo without destroying the earth. 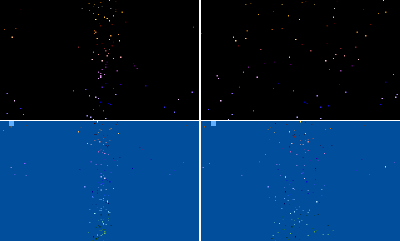 The first version uses a black background at the expense of having a group of smaller, even more chaotic Atari particles in the upper quarter. The second version forces all particles to be small and to behave less chaotic at the expense of having a background based on the blue sky instead of the dark space. Here is your youtube video. I hope some people will see it before the next upload rush next weekend. The Atari's executable leaves you with 26 bytes of code for this (6 bytes header). The executables start automatically from a game DOS or an emulator. When using MyDOS or ATARI DOS, the executable has to be started via "M - Run Address" at address "2000". added on the 2010-10-19 17:43:41 by JAC! 32bytes with design! I like. Wow, too cool for 32b. On AtariXL. Definite thumbs up! Here's your thumb for tiny coding! Colourful stuff on Atari XL = always a "thumb up". Thanks! And here are the lyrics, for those who are familiar with "ancient tongues". The youtube is jerky as always due to the lame 30 FPS replay, so I recommend the use the real thing or and emulator. It took some time but the uploaded version now runs on both. added on the 2010-10-20 23:22:33 by JAC! Nice one Peter, keep 'em goin'! page created in 0.036021 seconds with 15 queries.